2. Financial Report: The Treasurer reported that a shortfall of $1300.00 in donations caused a small deficit to the Picnic Account which has a current balance of $2,808.50. The General Account balance is $1,991.67. 3. Friend of the South End: Jill Stannard: Jill was recognized for her many years of supporting the South End Community, in particular, her role as historian and guide of the annual Heritage Walk; a popular feature of the Miners’ Day Picnic. She was honoured with the presentation of a ‘Friend of the South End’ Award and a floral tribute. 4. Elections: MP Leonard Krog attended to invigilate our annual Election process. 6. Caroling: A reminder that this years’ Caroling Event will be held in the plaza area in front of Iron Oxide Art Supplies at 7pm on Wednesday, December 17 mulled wine for participants and Michelle has volunteered to play the flute. 7. Art Bins: Volunteers are needed for our Art Bin Project. Contact Sandra or Chris LoScerbo to offer your time and talents. Needle boxes: Constable LaBerge reports that deliberations are in progress regarding placement of Sharps boxes. He will keep us updated. Patricia Pub: The Patricia is now closed. Nuisance Properties: He reports that the 2 nuisance properties at the North end of Haliburton have been quieted and that they are still working on issues with the View Street property. The Victoria Road property has now been demolished. He clarified for us that 75% of a property must be burned out or beyond remediation before the City can issue a demolition order. Shell­7/11­McDonalds: The RCMP met with these businesses and spoke with them about ways to deal with Street Activity at their properties. On Saturday they will have a walk­through of Wisteria Lane at 10 a.m. To discuss ways of mitigating problems with drug dealing/use in the area. 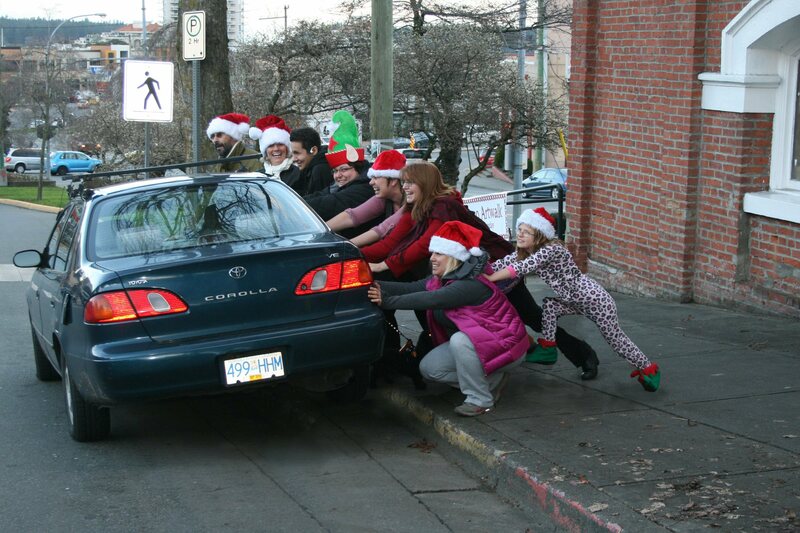 It`s time for some festive Car Rolling in the South End … or is that Caroling? You`ll have to join us to find out! December 17th at 7 pm, we`ll gather in front of Iron Oxide (in the Firehall building at Victoria Road, Nicol Street and Victoria Crescent). Songbooks, hot chocolate and goodies will be provided (and Willow`s making mulled wine); you just bring the muscle.